One’s been reminded recently of the adage (attributed to Churchill and others) that Russia (and its military) is never as strong, nor as weak, as it seems to be. Its military strength or weakness slides along a scale, constantly shifting. Though appearing to be in one place, it’s often already moving (or starting to move) in the opposite direction. Yesterday’s Red Square military parade marked the 69th anniversary of victory in the Great Patriotic War. It was quite an impressive display of fair Slavic manhood. As every year, Moscow understandably put its best foot forward. But we’d do well to remember this isn’t necessarily the face of the entire Russian military. This is the same country that gave us the Potemkin village and infamous 1955 Soviet Aviation Day flyover (and bomber gap). Be impressed, but don’t go overboard like many comments you’ll read. Russia’s armed forces have clearly improved in recent years. There’s even been an uptick since Shoygu replaced Serdyukov. But is Russia’s military development on a sustainable trajectory? Probably not, in this writer’s estimation. Shoygu’s efforts appear aimed at returning the armed forces to something approximating Soviet scale (or the unreformed, pre-2008 Russian scale at least). Despite the problems he ultimately caused, Serdyukov tried — not just to reduce the military’s proportions — but to make it fit its manpower, its logistical support, and its most likely threats. Russia’s annexation of Crimea and its build-up opposite eastern Ukraine have spurred observers to assess that Ivan’s 7-feet-tall and growing. Many of them never looked at Russia’s military prior to March. We should also note the Russians already had a huge military presence inside the borders of the country whose territorial integrity and sovereignty they violated. Russia isn’t the first (and won’t be the last) great power or superpower to use its foreign military bases for such a purpose. Such actions usually carry a high diplomatic, political, military, and economic price that has to be paid eventually. 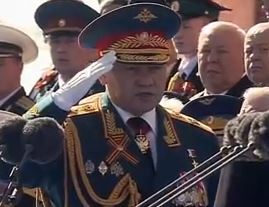 This entry was posted in Shoygu's Reforms and tagged 9 May, Parade, Red Square, Victory Day. Bookmark the permalink. Bomber gap? That was given to us by American analysts and faulty espionage albeit with a clever little trick. Yes, the clever deception caused the U.S. to fool itself about Soviet capabilities. With Russia, all is usually not as it appears. The American analysts and government knew full well the missile and bomber gaps were in favour of the US… it was the American public that was ignorant of the real facts. This is an interesting post… you start by mentioning an old saying that the Russians are never as strong or as weak as they might appear… though I would suggest that can apply to any enemy as fact often competes with stereotype and myth… I remember reading about the wonderful Japanese WWII fighters made of rice paper that couldn’t fly when it rained… the problem with stupid stereotypes is that someone gets to learn the truth the hard way which can be a particularly painful lesson… look up Japanese Knee mortar if you need an example. You then talk about the May Day Parade perhaps suggesting it is not about remembering those that fought but is instead a propaganda tool to scare ones opponents… which might be true, but cheapens the real meaning… to remember and not make the same mistakes again. You then ask if progress in improving the military is possible… just after suggesting it is a superficial rouse to pretend to be strong and your personal opinion is that it can’t be sustained. Then you continue to propagate the myth that Crimea joining the Russian Federation was actually an annexation by Russia against the will of the Crimeans and hint that eventually this will be “put right”. If Russia took Alaska by force… not only would the US respond, but the people of Alaska would immediately rise up and use force to resist. Russia has not and will not take Alaska by force because quite frankly it couldn’t. Russia has not and will not take the Crimea by force because quite frankly it couldn’t… if the Crimeans didn’t want to join it simply would not happen. Your post should not be about the May Day Parade and the improvements in the Russian military… the situation in the Ukraine and Crimea have nothing to do with the growth of the Russian military and everything to do with the pathetic state of the Ukrainian economy and the fairly steady growth of the Russian economy. Up until recently with its gas subsidies and investment Russia is what has been keeping the Ukraine viable as an economy… trade between the two countries was vastly greater than trade with the EU, so given the choice of austerity and the EU, or investment from Russia and China, of course they chose Russia and China… which resulted in a colour revolution and the current mess. This is nothing to do with military forces and everything to do with political and economic interference via the west which is leading to unrest in the Ukrainian population. Russia is being seen as an alternative but has really done nothing to encourage uprisings because at the end of the day I doubt Russia wants to have to pay for the infrastructure rebuild of the Ukraine as well as Russia. Putin will be overjoyed at getting the Crimea handed to him on a plate as a byproduct of Nyland stupidity, but he wont want a civil war that comes with bits of the Ukraine. He will therefore take steps to try to keep the situation calm to avoid bloodshed and get referendums under way so that talks can be held by elected officials instead of radicals on both sides. If areas choose to join Russia that will probably be accepted but I doubt they really want that either… they will likely just want autonomy from Kiev.